The structure of the Monkey Bars garage shelving in Cookeville provides more strength and greater efficiency than traditional style storage methods. 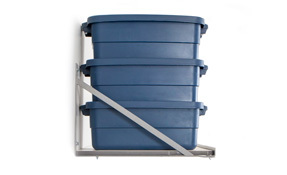 Our single shelf is capable of holding over 1,000 pounds of all your storage items. 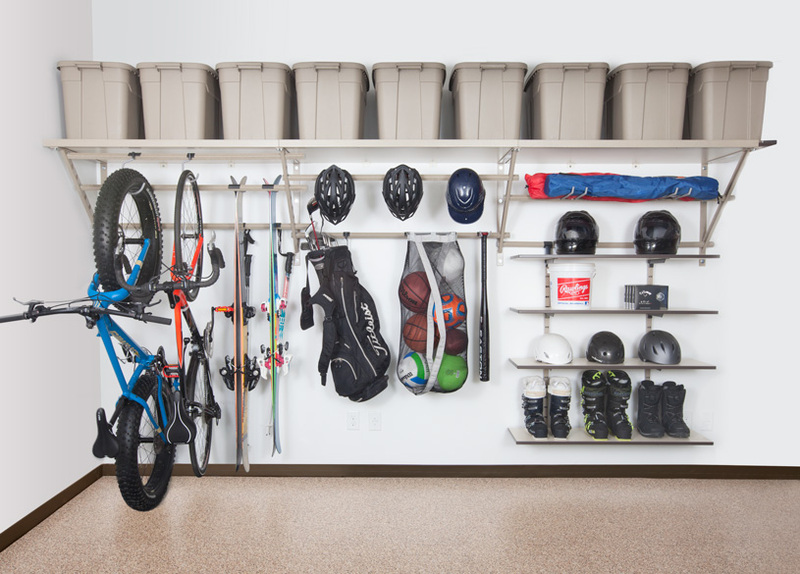 Designed to maximize on limited storage space, our systems are the right solutions for your garage storage and organization problems. 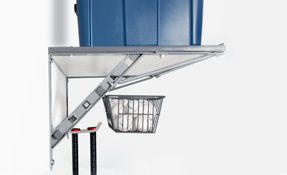 Easily adjustable hooks and bars make storage painless and simple. 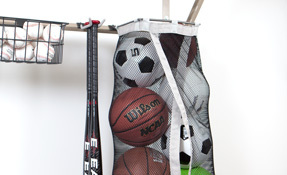 Hang bicycles, wheelbarrows, yard tools, sports equipment, or anything else you need. Because our system stores overhead, your garage floor space will be left open and free from clutter. We have complete confidence in the reliability of our system. 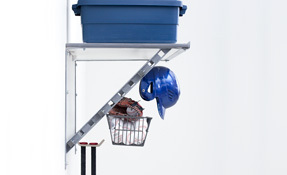 To prove it, we offer a lifetime warranty on all garage shelving in Cookeville. We understand and strive to meet the diverse needs of our Cookeville customers. 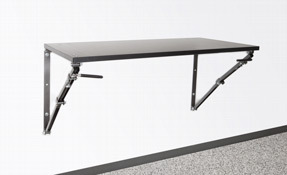 We have different systems and accessories that are sure to suit your needs and interests. 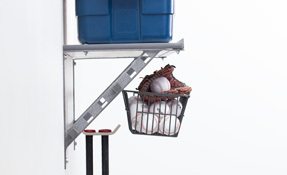 Layered Storage: Get more use out of your garage shelving in Cookeville by layering storage items in front of and behind the Monkey Bar. 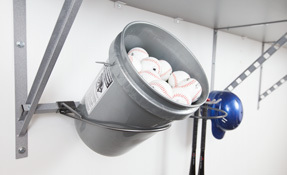 Our 11 different patented, rubber-coated hooks can create multiple layers, maximizing on your limited storage space. Mounted Shelves: Our wall-mounted shelves are perfect for high ceiling areas, over windows, and above garage doors. 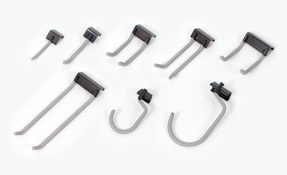 Hang with Hooks: Get the clutter off the floor with our adjustable, hanging hooks. 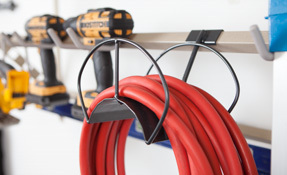 Select from 11 different patented, rubber-coated hooks to safely store any storage item from bikes, to yard hoses and sports equipment to wheelbarrows. Monkey Bars is committed to meeting the specific needs of your garage shelving in Cookeville and the surrounding areas. 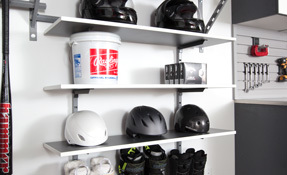 We will personally assess and meet your garage shelving needs. 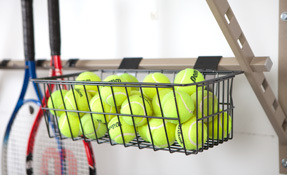 Get the clutter off the floor and neatly store your items with a Monkey Bars Garage Storage System. 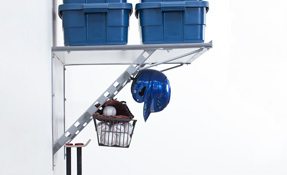 Adaptability: The Monkey Bars Garage Storage Systems are totally adaptable and can easily be integrated with other products, such as overhead storage or wall mounted cabinets. Increased Square Footage: The average Monkey Bar system increases a homeowner’s usable square footage by 50%. 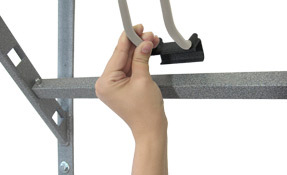 Shelf Mounting: Perfect for garages, sheds, storage units and commercial buildings, Monkey Bars garage shelving mounts to stud, brick, cinder block and concrete walls. 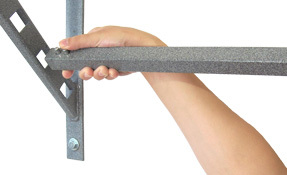 Lifetime Warranty: All Monkey Bars products are backed by a lifetime warranty. 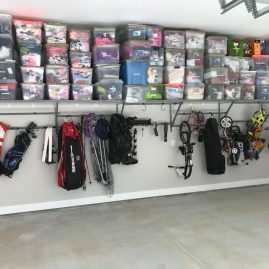 If you’re ready to transform your garage, call us today for a free estimate on the best garage shelving Cookeville has to offer!